A worker works on the door assembly of a Citroen Berlingo van at PSA's plant in Mangualde, Portugal. 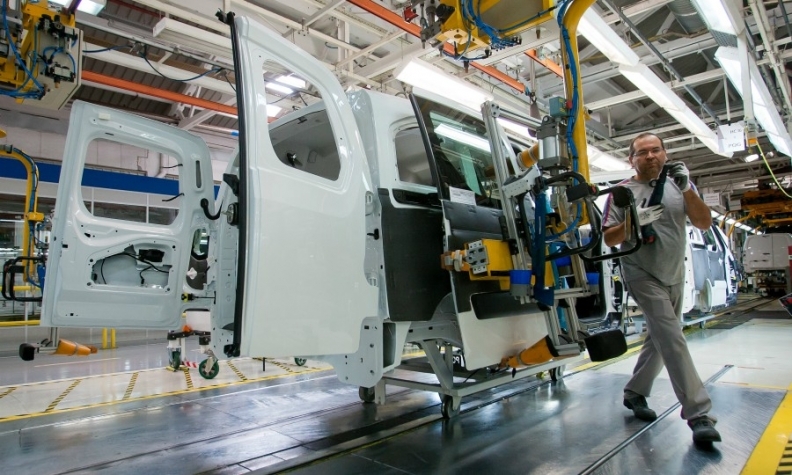 PARIS -- PSA will add a third production team and hire 225 additional workers at its plant in Mangualde, Portugal, in response to increased demand for the Citroen Berlingo and Peugeot Partner small vans, the automaker said in a statement. The current versions of the Partner and Berlingo have been produced at Mangualde since 2009. They are slated to be replaced later this year with a new version co-developed with Opel under a 2012 agreement with General Motors, which sold its Opel and Vauxhall brands to PSA in 2017. Opel's version of the van will be called the Combo, and is also expected to be built at Mangualde. The vans will also be built at PSA's nearby plant in Vigo, Spain. The current Opel/Vauxhall Combo is built in partnership with Fiat Chrysler in Turkey. PSA is consolidating its van lineup, having discontinued its subcompact Citroen Nemo and Peugeot Bipper. The new production team at Mangualde will start in April, earlier than planned, after van demand rose, PSA said. It will be in place at least until the end of 2018, with its future determined by sales of the new versions. Last year 53,600 vans were built at Mangualde, the highest figure in four years, the company said. PSA reported this week that global sales of light-commercial vehicles grew by 15 percent worldwide (including Opel/Vauxhall from Aug. 1) to 476,500 vehicles. In Europe, the company says it leads the market with a 20 percent share. PSA said earlier this year that it would be starting production this spring of its midsize Peugeot Expert and Citroen Jumpy vehicles in Kaluga, Russia. According to JATO Dynamics, the Berlingo was the fourth-best selling light-commercial vehicle in Europe, with sales rising 8 percent to 80,108 through November. The Partner was in fifth place, with sales rising 6 percent to 78,067. The Ford Transit was No. 1, at 98,135 units sold.